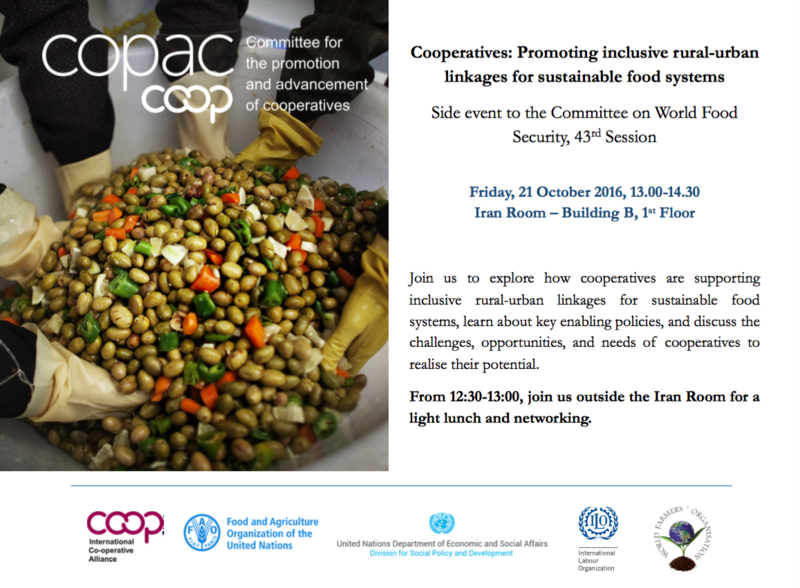 At the Committee on World Food Security, taking place in Rome on 17-21 October, COPAC will host a side event on the topic “Cooperatives: Promoting inclusive rural-urban linkages for sustainable food systems”. The side event will feature the contributions of cooperatives on this topic and explore ways cooperatives can do more. Agriculture and food systems are evolving in a context of accelerated urbanisation and increased strains on natural resources. While urban food insecurity and malnutrition grow, the majority of the world’s poor still live in rural areas and depend on agriculture for their livelihoods. Meeting rural and urban demand for food will require dramatic changes in the food production and consumption patterns, while building resilience to climate change. Transitioning towards more sustainable food systems would require strengthened linkages between rural and urban areas, involving the inclusion of small food producers. Cooperatives have a dedicated role to play on both the producer and consumer sides. Combining economic and social goals, cooperatives can boost food production, increase their members’ incomes, generate employment opportunities, help mitigate and adapt to the effects of climate change, and provide affordable opportunities to poor rural and urban consumers, including women and youth. However, the diversity of cooperatives, their capacity to innovate, and their intrinsic flexibility can often be overlooked, despite cooperatives being critical actors for sustainable food systems. The side event at CFS43 will feature opening remarks from Marcela Villarreal, Director of the FAO Office of Partnerships, Advocacy and Capacity Development Division, to be followed by a panel moderated by Jamie Morrison, Strategic Programme Leader of FAO Strategic Objective 4 “Enable more inclusive and efficient agricultural and food systems”. The panellists include Shigeshi Onishi, Executive Director of the Central Union of Agricultural Co-operatives (JA-Zenchu), Paulo Gouveia, Chief Policy Advisor at Copa-Cogeca, Walter Katajamäki of the Cooperatives Unit in the Enterprises Department of the ILO, and Judith Hitchman, President of the International Network for Community Supported Agriculture (URGENCI). The panellists will present concrete experiences of cooperatives in supporting inclusive rural-urban linkages, discuss the challenges and opportunities for cooperatives to play a greater role, highlight key enabling policies that have worked, and explore what capacities need to be strengthened in order for cooperatives to realise their potential as key actors in the transition to sustainable food systems. Participants will be invited to interact with the panellists in an open discussion. The event will take place on Friday, 21 October 2016 from 13.00-14.30 at FAO headquarters in Rome. Download the full programme or see the event flyer.